Around these parts, we are big fans of the Mercedes-AMG GT, because we have eyes and ears and utter contempt for our driver’s licenses. But we are aware of its limitations. It only has two seats and two doors, so the number of folks who can join you for its biturbo V8 shenanigans is just one. Until now. 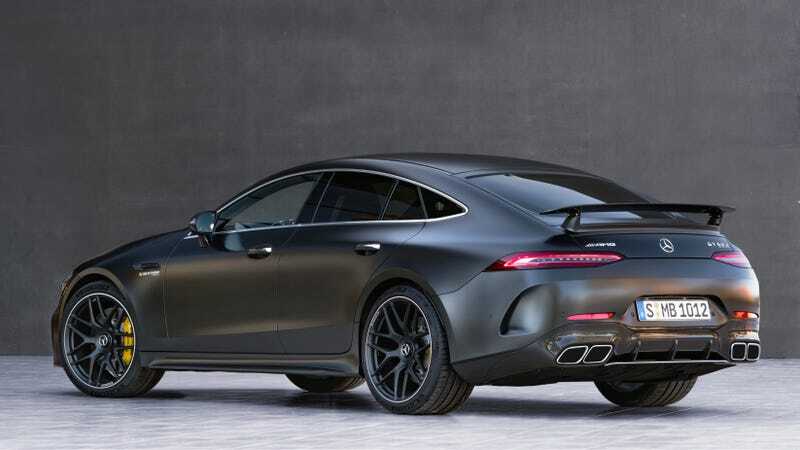 Meet the super-sized 2019 Mercedes-AMG GT 4-Door Coupe. Mercedes pulled the wraps off this super sedan at the Geneva Motor Show today, and it has a lot of the same guts as what you get with the sports car, including the hatch for extra practicality. Like a lot of sedans we’ve seen lately, it fully embraces being a fastback, which is great. It comes in two V8 flavors: 63 and 63 S, with 577 horsepower and 630 HP, respectively. Zero to 60 mph times are said to be just 3.3 and 3.1 seconds on those, respectively. Mercedes’ 4Matic all-wheel drive is standard on both. This one gets AMG’s trick nine-speed multi-clutch automatic gearbox. And what’s most interesting of all is that the sedan variant of the AMG GT gives you even more options: namely, it also can be had with Mercedes’ new EQ Boost hybrid inline-six if you decide the 4.0-liter biturbo V8 is a tad, uh, much. That motor puts out 429 HP and 384 lb-ft of torque, does zero to 60 mph in 4.4 seconds and gets the name GT 53. It does all this with a torque converter-equipped nine-speed automatic. No word on pricing yet, but this looks like an extremely promising shot at the Porsche Panamera. I can’t wait to see it in person.